Jack Binion is well known in Las Vegas . He was one of the original casino entrepreneurs that built that town up into the gambling paradise that it is today and for that reason he is accorded a lot of respect. Binion's Casino was his first and dearest creation and for that reason the casino has a rich tradition and history that turns most other casinos green with envy. Binion's Casino is not located right on the Las Vegas Strip. For many people this might be a deal breaker but it is important at the same time to understand that in Jack Binion you are dealing with one of the smartest gambling entrepreneurs the world has ever seen. Jack Binion designed his casino so that it would be close enough to the strip that people could walk there, but far enough away that the primary hustle and bustle of the strip was muted. It's arguably the best position to be in when you are building something in the city of Las Vegas . If you want to game at Binion's Casino, you have definitely come to the right place. There are table games all over the place, allowing you to place bets at tables for roulette, blackjack, craps and many other table games as well. Stakes very from very low to very high, giving you the maximum gaming experience. One thing that is worth noticing about the slot and video poker gaming at Binion's Casino is that there are several machines that have been independently certified to have a payout percentage of 100%. These machines are the different quarter video poker machines, requiring $1.25 per hand for the maximum 100% payout percentage to apply. It is something that very few casinos will offer you, but it is something that Binion's Casino will offer you nonetheless. Poker is a big thing in Las Vegas and Binion's Casino has a poker room that you'll love. There are free lessons available in poker if you don't know how to play and once you get the hang of the game, the room is open to you around the clock. Binion's Casino has one of the most famous poker rooms in the world and you'll know why it is famous the moment you walk in. If you need a break from casino and poker gaming, Binion's Casino also has a sportsbook available. You can place bets on sporting events like horse racing and your local team sport and then comfortably watch the game unfold. You can a pply for credit from Binion's Casino if you run out of money or if you plan to do regular playing sessions at the casino. In addition to that, you can also join their ultimate rewards program. This program allows you the chance to accumulate money for nothing more than playing at the casino. It goes well together with their complimentary drinks program, something that you should definitely take advantage of if you visit. 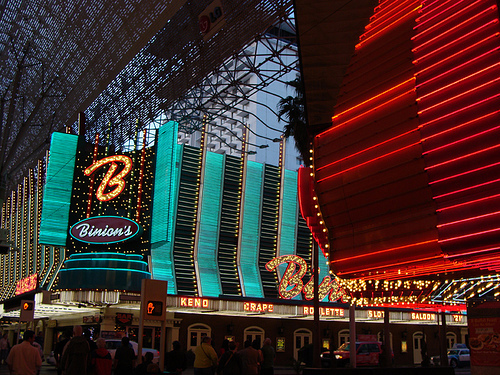 Binion's Casino is the real deal, right from the historic tradition up to the modern excellence. It is easily in the top tier of Las Vegas casinos.